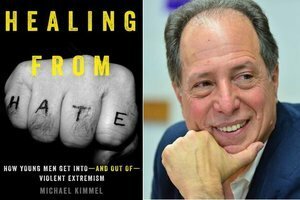 In his previous book, Angry White Men: American Masculinity at the End of an Era, published in 2013, sociologist Michael Kimmel captured the emerging zeitgeist of white male entitlement and resentment that Donald Trump would soon tap into. However, Kimmel, a professor of sociology and gender studies at Stony Brook University of New York and director of its Center for the Study of Men and Masculinities, didn’t actually mention Trump in that book. Only later, he writes in an updated introduction to a recently published new edition, did he realize that he’d been focused on a cohort that can now be seen as “waiting for their leader to show up—even if they (and I) didn’t know it at the time.” One can only hope that Kimmel’s latest book, Healing from Hate: How Young Men Get Into—and Out of—Violent Extremism, will prove as prescient as his last in capturing the nation’s mood, this time in the direction of reconciliation. I have a subscription. How do I read this article online (and others in the future)?